Initiative Project for a period of one year on contractual basis. Total vacancies available in this Greater Chennai Corporation Recruitment are 36 posts. Candidates with all essential/ requisite criteria can attend walk in interview, will be held on 31st October-2017. See the below given details for venue of the Interview. Applicants have to carry original and self attested copies of all documents at the time of Interview. To know the updates regarding GCC recruitment please visit www.chennaicorporation.gov.in. After this engagement selected candidate will be offered monthly salary of Rs. 10,000/-. Further details of Greater Chennai Corporation GCC Lab Technician, Field Supervisor Jobs general recruitment essential qualification details, age limit, Pay scale, method of selection, Application procedure, Interview details are mentioned below. Total vacancies available in Greater Chennai Corporation Recruitment are 36 posts. 1. Lab Technician: 15 posts. 2. Field Supervisor: 21 posts. Candidate must have age limit as per GCC govt rules. Lab technician: must have qualified Intermediate and certificate course or Diploma in Medical Laboratory Technology. Candidates with 1 year experience in Sputum Smear Microscopy or RNTCP. Filed Supervisor: candidate must have 10+2 qualification with work experience as LHV/ ANM/ MPW (OR) Tuberculosis Health Visitors course & certified course in computer operations. Check the GCC notification for other qualification details. 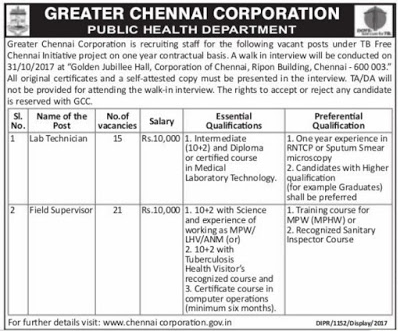 Eligible candidates who are interested for GCC Lab Technician, Field Supervisor Jobs need to attend walk in interview. Walk in Interview will be held on 31-10-2017. Ripon Building, Chennai, Pin- 600003. Interested applicants may go through the GCC official website www.chennaicorporation.gov.in for guidelines. Eligible applicants have to attend for walk in Interview which will be held on 31-10-2017. Candidates must submit the original documents and self attested copies in the Interview. For more details see the GCC official website.